UPDATE, NAMES RELEASED: The names of the man and woman and their charges in the story below have been released. The man's name is Keelyn Demarcus Thomas, 22, of Longview. Howard has been charged with felony possession of marijuana and evading arrest in a vehicle (also a felony). The woman's name is Corletta Michelle Thurman, 38, of Longview. Thurman was charged with felony possession of marijuana. Both were arrested on October 3, 2012 when a State Trooper attempted to pull them over in a routine traffic stop. A brief chase ensued before they were stopped in South Polk County. 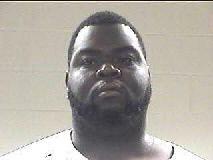 ALSO ARRESTED AT THE SCENE: Reggie Howard, 29, of Longview. Howard was charged with felony evasion in a vehicle and felony possession of marijuana. Editor's note: When our cameraman arrived at the scene, Reggie Howard had already been loaded into a unit so we didn't get his picture from the scene. Reggie Howard, 29, of Longview. Trooper Ryan Clenneden confiscated a trashbag with shoebox size tight bundles of marijuana inside. Trooper Seizes Bundles of Marijuana in Traffic Stop, GOODRICH, October 3, 2012 - At approximately 5:25 pm on October 3, 2012, Trooper Ryan Clenneden with the Texas Highway Patrol was attmempting to make a traffic stop on US-59 (north-bound) in San Jacinto County. The driver didn't want to stop initially and the chase proceeded over the Trinity River Bridge into Polk County. Deputies from the Polk County Sheriff's Office and local Trooper Allen Stanton were dispatched to assist. The vehicle (a late model brown Dodge 1500 pickup) finally stopped near the south end of Goodrich. Both suspects were apprehended and cuffed. A vehicle search produced a trash bag that had four large tight bundles of marijuana (each bundle was approximately the size of a shoe box). The suspects' names are being withhled at this time. Both suspects were transported to Polk County Jail. The suspect vehicle was recovered by Fawbush Wrecker Service. In June of 2011, Trooper Clenneden and his canine partner, "Raider", made a sizeable cocaine bust in Goodrich. In May of 2011, Raider helped uncover 4 lbs. of marijuana in Goodrich. Trooper Clenneden speaks with the driver. Trooper Sean Barnes (at left from San Jacinto County) assisted. The passenger was also placed under arrest. Shoebox sized tight bundles of marijuana. Mixi watches from the PolkCountyToday.com Jeep. Mixi sees many bad things at a very young age. Suspect vehicle was recovered by Fawbush Wrecker Service. If you would like to comment on this story, we'd love to hear from you. Your name will be posted with your comment in Letters to the Editor.